This article describes a way to do a d.y.s.p. with eight sprites, using flexible cycle-wasting in the loop. This method differs from the $d017-approach in that we can use the full 21 lines of a sprite. Unfortunately this means our loop gets a little more complicated due to the fact that the number of cycles on a given raster line is now dependent on the number of sprites on that line. can be used to assemble to code into a runnable .prg file. By altering the branch instruction to skip a variable amount of bytes of code, we can determine the number of cycles the loop must waste on a raster line. Generally speaking, the more sprites we have on a line, the more cycles the VIC eats, which means we have to branch further to skip more cycles. The “cpx #$e0 … bit $ea” code is used to waste cycles with an accuracy of a single cycle, I use the same trick to time VSP's (with a few more “cpx #$e0” instructions). So for each additional byte we branch over, we either end at BIT $EA (3 cycles) or NOP (2 cycles). Now we can waste anywhere between 0 (no sprites) and 17 cycles (all 8 sprites). To determine how many cycles we need to waste, we need to know how many cycles each combination of sprites uses. That's where the 'cycles' table comes in, it gives us the amount of cycles sprites use for each 'sprite enable'/$d015 value. I used a little tool to determine those values, using brute force: for each combination I adjusted the cycle-delay until I got the proper value. The tool is also on GitHub, but be warned, the code is a little messy. For each sprite, at the proper Y-position, we ORA 21 values of the sprite enable table with the bit value for that particular sprite: $01 for sprite 0, $02 for sprite 1, up to $80 for sprite 7. And there you have it, we now have a D.Y.S.P. with flexible Y-positions. Naturally all this calculating eats cycles, which is why my code uses a lot of unrolled loops. Finally, the code. 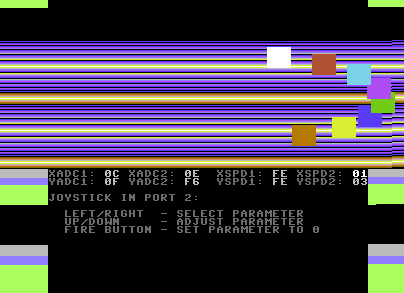 It also contains a little user interface, allowing the user to change the DYSP's movements with a joystick in port 2. .text "xadc1: 00 xadc2: 00  xspd1: 00 xspd2: 00"
.text "yadc1: 00 yadc2: 00  yspd1: 00 yspd2: 00"
.text "joystick in port 2:                     "
.text "  left/right  - select parameter        "
.text "  up/down     - adjust parameter        "
.text "  fire button - set parameter to 0      "
; value in the BPL argument we can waste between 0 and 17 cycles inclusive. ; easily add three raster splits. .cerror * > $0fff, "code section too large!"